Chutney is a word we have borrowed from the Hindi language and even though the condiment is from South Asia, it is an extremely common ingredient that can be found in most South African homes. In fact, when I went to Germany earlier this year Michelle asked me for Mrs. Ball’s Chutney. This is a truly South African product, and when we were growing up came in one flavour only. The brand has grown, and all sorts of flavours are now available. Unfortunately for me there is no sucrose free one available on the market and so I have resorted to making my own for the past 20 years. Please note, do not be too exact with the vegetable measurements, just get as close as you can! I also love pickles and after this last bottle of gherkins I have just bought I am going to start making my own again as they need to be crunchy! My Gran used to make Mango Chutney every year enough for the whole year till the next season. I took over a few years ago, but have not been in Zim during mango season for two years so the family supply has run out! We used to eat chutney on just about everything, either that or home made tomato sauce or homemade pickled onions. This recipe looks great. I should try home made mango chutney some time! That looks great! I am cooking up some eggplant (as we call them in the states) today for my event on Saturday, I may try this. I recall going to a little farmer’s market outside of Hilton when I was in South Africa. I bought some home made Chutney and brought it home (I paid a fortune in luggage overage fee’s) . I served it as dip or something at a party and my quests went crazy for it. 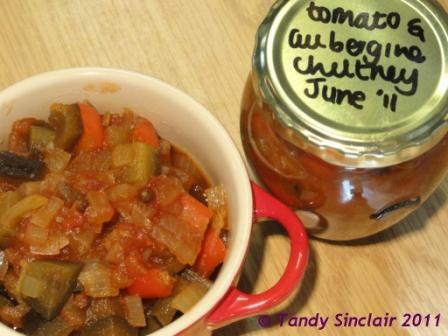 Lovely recipe – I am currently looking for ways to use my aubergines! Wow,I always wonder where do you get all the time to make these amazing stuff!!? Have a great day! Wonderful recipe Tandy. Will definitely be making this soon! It must be quite challenging finding products that don’t contain sugar. Hope Woolies has a big enough supply of products for you. it has a nice bite to it! how much fructose do you use Tandy? I would really like to try this recipe and my husband is a diabetic so this would be an awesome replacement.